There is nothing more liberating that packing up your cigarette case for the last time and being absolutely sure that you will not be sparking up any more tobacco cigarettes. Not now, not ever. Giving up smoking takes determination, motivation and it really does need to be the right time for you. I gave up ten years ago when trying to conceive my first child. I attended the NHS clinic and eventually kicked the habit. I was smoke-free for five months before something rather devastating happened in my home life and in a fit of rebellion as much as anything else I bought another pack and started back up again. With hindsight I think the time was wrong regardless of what happened as I had given up because I felt I should, not because I wanted to. That “light-bulb” moment came not long after and I packed up completely. I’ll have been cigarette free for nine years on the 4th November and have to say I’m quite proud of myself. Quitting smoking is not easy for anyone. 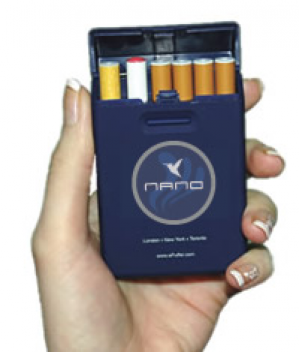 Apart from the nicotine cravings there are so many habits that you build up around cigarettes which are hard to break. Even after all of this time there are certain situations which bring back amazingly strong cravings despite not feeling them for years. Stress is one and social situation are most definitely another. At a gathering recently there was music, dancing, laughter, nibbles and lots of sitting around and chattering. I’m not the social butterfly I once was, being something of a “home-bod” nowadays by choice however being back in the same situation where I would have once smoked a fair amount I found myself tempted, very tempted. A good friend, who clearly knows me very well, dragged me to one side and gave me her sonic screwdriver (our name for her ePuffer e cigarette). Having that alternative, which was loaded with nicotine free e liquid, stopped me falling back into bad habits and I am very grateful. I’m not planning to move from non-smoker to e-smoker however the situation has opened my eyes somewhat to the benefits of e smoking. I fancy that had this technology been around nine years, ten years or even further back that I would have made the switch over earlier in an effort to cut down on what I was inhaling nicotine-wise and eliminate the chemicals being absorbed. I would definitely have used an e cigarette down the line to quit altogether alas this simply wasn’t an option at the time. Having an e cigarette around stopped me breaking a resolution which is important to me when I was feeling sorely tempted. There is talk about the use of e cigarettes being used from 2016 as a regulated means to help people quit smoking altogether with the insinuation that they may even be available on NHS prescription. I have to say that as an ex-smoker I feel this could be a very positive step forward from a health-perspective. Long-term it could help reduce the vast amount of month that the NHS is spending on smoking related illness and certainly encourage smokers to cut down if not give up altogether. What do you think? Do you smoke tobacco cigarettes? Are you an e smoker? I’d love to hear what the Sunday Woman readers think of the so-called e smoking revolution.